How To Stop Sugar Addiction - Are you pre-diabetic? How to stop sugar addiction ... is this your problem? Chances are nearly everyone these days has a very serious sugar habit. Do you know how much sugar we consume? According to a report on MSNBC, Americans eat 70 lbs. of sugar a year! That's roughly 22 teaspoons a day. All our lives we've been told not to eat too much sugar because all sorts of bad things would happen. Now they are happening ... the whole world is becoming diabetic. We need a universal diabetic diet plan. We need to get smart about permanent fat loss and we need low glycemic sweeteners. Obesity and the numerous diseases that go along with it can even be life threatening. If they don't kill you they certainly will shorten your life. Mainly OUR mothers were concerned that over time we would get fat... which is bad enough but such widespread obesity was not happening 25 years ago. MOST Americans are now fat! 60% of us are overweight and an incredible 1/3 of the American population is obese. Could it be because food manufacturers are now stuffing their processed foods with high glycemic carbohydrates that act like sugars in the body? It's good for business to get us hooked on sugar but there is a practical reason. These are the ingredients on the label you may not recognize as sugar: maltodextrins, corn syrup, glucose polymers, dextrose, barley malt. There is a reason the food companies put these high glycemic carbohydrates in their processed foods. They act as preservatives. The problem is they do NOT appear in the sugar content on the label and they make you fat. These sugars cause fat storage and it all has to do with the hormone called insulin. Insulin is released when we eat carbohydrates to carry the glucose (sugar) to our muscles for energy use. If there is excess glucose because we are eating too many high glycemic carbs and not exercising enough, then insulin signals the body to turn it into stored fat! It is easy to eat too many of these carbs when they are "hidden" in most processed foods. We need to know how to stop sugar addiction because it can lead to dangerous diseases. Nowadays we know that high blood sugar and insulin overload can also lead to depression, premature aging of the skin, hypertension and then to the universal killers, heart disease, cancer, and diabetes. Even pre-diabetes (high-normal blood sugar) can lead to kidney disease, cognitive impairment, pancreatic dysfunction, diabetic retinopathy and neuropathy. So, this just goes far beyond trying to get into your size 10 levis. How to stop sugar addiction requires understanding where these intense cravings come from. When you eat these high glycemic carbs they burn quickly and your body screams for more sugar to turn into energy. Its a vicious cycle. The more you eat sweets the more you crave them. Sugar addiction takes a terrible toll on your body and first leads to type 2 diabetes and then metabolic syndrome. These are the indicators your body is starting to malfunction. Metabolic syndrome represents a hormonal nightmare. These conditions could lead to more serious "sugar" diseases. One of my primary goals with this website is to educate people about the glycemic index so that you know how to stop sugar addiction by eating a healthier diet. First and foremost is to eat low glycemic foods! When you eat low glycemic foods you have low blood sugar which sustains your energy over the course of a day. Use this low glycemic food list and eliminate all the high glycemic foods from your pantry and from your life. Substitute the low glycemic sweeteners for sugar. When you get away from sugar you will be much happier with a less intense sweetness. Eat 1/2 teaspoon of cinnamon in your tea, water, coffee or in a smoothie. Optimally do this before two meals. It will lower the glycemic response of the food and help reduce your blood sugar. Squeeze 1/2 a fresh lemon into a glass of water and drink it throughout the day. This will also reduce food cravings. This is how you stop sugar addiction, one day at a time. The cravings GO AWAY when you stop spiking your blood sugar! If it tastes sweet don't eat it. This sounds hard but once you stop "feeding the beast" by eliminating processed foods and other high glycemic foods, it gets easier. Drinking the lemon juice will help. It will also help to eat lots of alkaline foods. The more greens you eat the easier it is to lose your craving for sugar. You CAN stop sugar addiction. Get into the habit of reading the labels carefully of any food you buy in a box or package. Try juicing greens. This may be the most efficient and fastest way to get rid of a sugar addiction. When you change your blood chemistry to a more alkaline state your cravings fade away. Avoid the high glycemic carbs that are in so many popular foods. You may be eating an energy bar, drinking a sports drink or just having some canned soup which you think is acceptable on your diet, but guess what? These are the foods loaded with sugars. 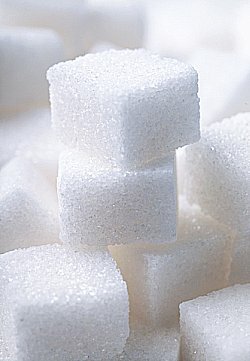 The high glycemic carbs that are in most processed foods cause excess insulin and tell your body to hold on to the fat. How to stop sugar addiction? Read labels and avoid processed foods with additives. Don't be fooled by these fat traps. Just because it's not called sugar doesn't mean it won't act like sugar when it's in your body. Cinnamon can greatly assist you in managing your weight by supporting low blood sugar and the regulation of fat metabolism. This is a safe, natural fat blocker that really works to burn fat effectively. Return from How To Stop Sugar Addiction to Insulin Resistance. Return from How To Stop Sugar Addiction to Lifetime Fat Loss home page.